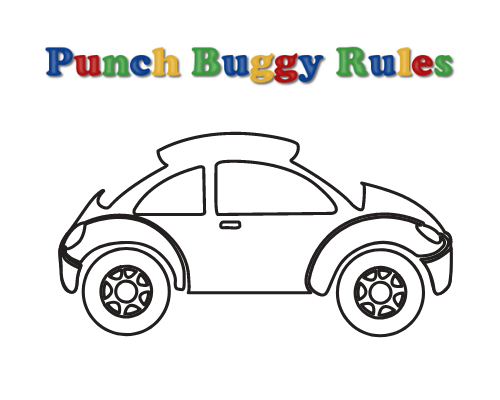 This children’s car game has been played since the 1940’s, that’s nearly 80 years of Punch Buggy history. So naturally, the Volkswagen Beetle has accumulated quite a few nicknames such as: punch bug, punch car, punch dub, piggy punch, beetle bug, slug bug(oldest-version), and the infamous “Punch Buggy.” Although the child’s game may have always seemed universally straight forward, there are multiple variations of “Punch Buggy.” The possibility of any inconsistencies has inspired us to gather a collaborative compilation of information in an effort to develop the official rules of punch buggy. Additionally, we will be including everything you need to know about the Volkswagen Beetle’s origin, it’s model variants and its transition from old-school-to-modern. What is a Punch Buggy? 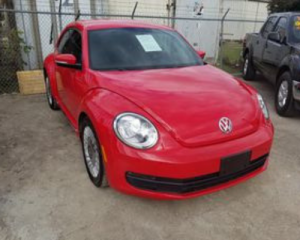 The phrase “Punch Buggy” is a popular nickname for the Volkswagen Beetle; Punch buggy is a car game in which participants will punch other participants on the arm during the sighting of a Volkswagen Beetle all while verbally announcing their sighting of the Punch Buggy car. What Type of Car is a Punch Buggy? Its original design intention was to serve as an economy car or the German Soldiers. Eventually German brand name “Volkswagen” translates to English as “the people’s car.” The automobile company Volkswagen was headquartered in Wolfsburg Germany at the time of World War II. The intention of creation for such an industry was to build a network of autobahns and highways in Germany. Once World War II ended, Volkswagen’s automotive development project was scaled to a massive size. Therefore, there was a need to create a design concept for a vehicle would be both affordable yet quick on the production line. With the help of Austrian automotive engineer Fedinand Porsche, the Volkswagen Beetle came into fruition and later into production. At the time of production the cost of a 1938 Volkswagen Beetle was $140. The Beetle truly had big shoes to fill with it’s statement of creation. Immediately after its prototype phase, the 1940s Volkswagen Beetle (Gen 1) gained massive public interest. Its transformation from the traditional sedan style car into a four-person seating car with a convertible top exploded in popularity. Tagged along with luxury features like dual rear ashtrays, twin map pockets, visor vanity mirror on the passenger’s side, rear stone shields and wheel trim rings. This car was considered “fully-loaded” with features that wouldn’t show up on other models of the beetle until 1970. With the overwhelming success of the first-generation model there was high drive to create a second generation of the first model. 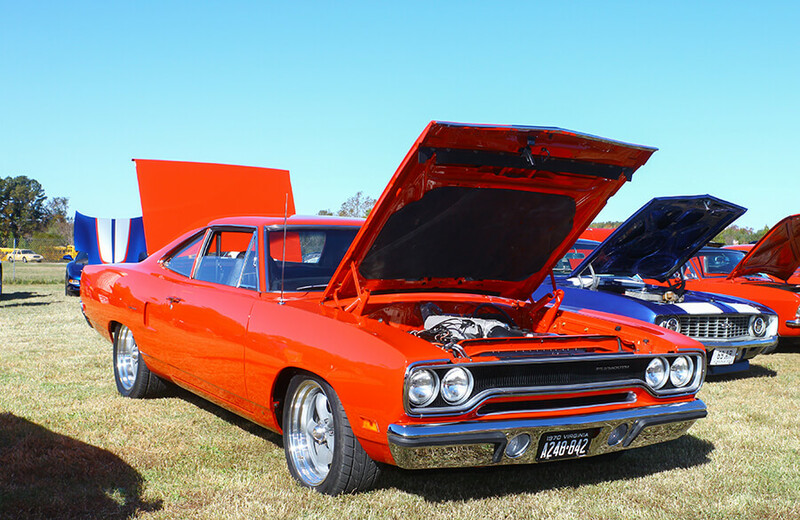 This “Gen 2” model came with vast technical advancements such as hydraulic breaks and a folding sunroof. Models in the Gen 2 body life had a redesigned instrument panel (dashboard console), as well as a change in the location of brake lights. The rear of the car also went from a divided oval to a singular oval. 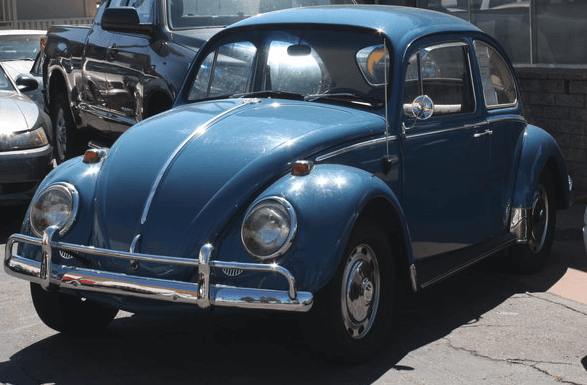 Late into the second-generation body style the Punch Buggy had a “staple” feature added onto its exterior, with the inclusion of twin chrome tailpipes as well as a taller bumper guard. This also included another design of the instrument panel. The 1960’s was a big decade for Volkswagen and their 2nd Generation model. The second generation beetle dealt with significant look changes. This trend continues into the following generation with the addition of technical advancements with its engine, transmission, safety features, cabin changes, and quality of life upgrades. The engine modifications provided an increase to its overall horsepower while keeping a similar engine size of 1.2 Liters. Additionally, with the inclusion of a 3-speed semi-automatic gearbox the 1960 VW Beetle had its first version of an automatic transmission. As the Volkswagen Punch Buggy grew in popularity, it attracted an international demand specifically in the United States. Which if the vehicle was to be sold in America, the vw punch dub had to make a few design changes to its overall safety. American auto standards safety standards requires: trigger-operated outside door handles, a secondary front hood latch, a collapsible steering column, soft vent window latches, rotary glove compartment latch and pictures incorporated on the instrument panel. Gen 3 models were also given some quality of life upgrades such as a mechanical fuel gauge– no longer needing the driver to rely on a fuel tap – a larger turn signal light with an amber tint. Both predecessors (Gen 1 & 2) suffered from wasted cabin space, lead to the Gen Three cabin remodel. The focus was primarily on the windows of the car itself, along with the front and rear windshields. The result was an increased curved surface, as opposed to a flattened design. The result was a more modern looking car, that had speed, looks and luxury. Beginning in 1970, a new “Luxus Package” was available to consumers willing to pay premium price. Some of the changes included the incorporation of twin map pockets, dual rear ashtrays, full carpeting, passenger-side vanity mirror and rubber bumper moldings. While also introducing optional upgrades to the car’s engine itself with a new 1500 cc model (1600 cc in America). A year later, 1971 the advancement of Gen 4 split into two options. The first was the familiar model we are all used to as well as a larger model with a new larger version. Both models had an optional 1600cc engine that would output 60 hp. The 1972 model was improved to have a slightly larger rear window(10% larger) and made an industry standard incorporating the convertible engine was introduced at the beginning of the year a new model was revised allowing for 43% more luggage capacity, showing a noticeable increase from the original model that had a small area for luggage. Towards the end of the model’s run the front turn indicators were moved from the top of the front fenders down into the bumper. In 1979, the last of the 4th generation Volkswagen Beetle was produced and marketed. With its production being halted back in 1979 there was enough of a draw for a revitalization of the punch buggy. This car was slated to hark back to the “retro” design everyone came to know and love, but with updated internals. This vehicle was slated to call back to the original model, with exterior tropes returning such as separate fenders, sloping headlights and large round tail lights and rounded roof line. This model was also aligned with partnerships releasing limited run models as well as special anniversary models. The Seventh Generation Beetle was given a more modernized look with an iconic shape, the car looks sleeker and more modern feel and to distance it from the New beetle (now old punch buggy) released a few years prior.Unfortunately, it seems the 2019 Volkswagen Beetle will be the last of its kind unless Volkswagen states otherwise. With all that said, one question persists. What came first, Punch Buggy or Slug Bug? 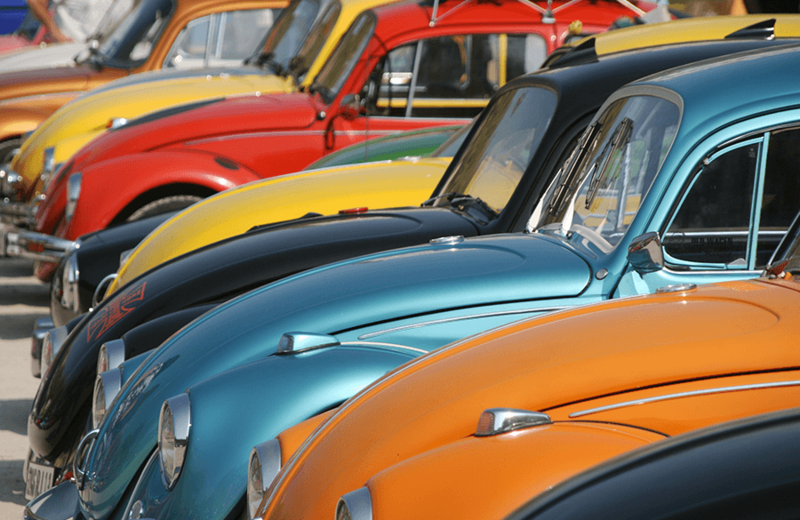 As historic witnesses state, the beginning of the “Slug Bug” game originates in Germany around the 1940’s. 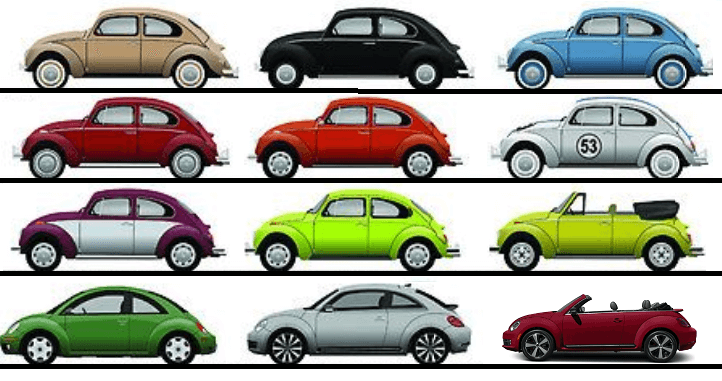 This correlates to just after the release of the first Volkswagen Beetle that was introduced in Germany in 1938; So as history dictates, the first nickname for the VW Beetle is Slug Bug Car, also called the Old Buggy Car! Even though Volkswagen’s Beetle sales started off crawling in the United States when compared with the rest of the world. When the 1960’s hit, the VW Beetle became the top-selling import in America due to a few iconic ad campaigns by the firm Doyle Dane Bernbach. The Beetle became a legend in the United States; by representing simplicity, efficiency, modesty, and a seemingly timeless design pioneered a change from the conventional 1950s “bigger-is-better” mindset. The Beetle’s aerodynamic design, four-wheel suspension, low center of gravity, and use of lightweight metals made the original it more advanced than nearly any rivaling car of its time. 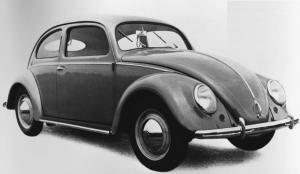 Why the Volkswagen Beetle Got Big. Additionally, the Beetle was easy to fix, reliable, customize-able and has remained an inexpensive alternative for most buyers. Since the Beetle has practically been there for nearly all of automotive history. experiencing and participating in over half a century history, pop culture, movements, and memories. Not only has the VW Beetle has been a stable in America’s culture, but has also shared memories across Europe, South America, Asia, Australia, and South Africa. While the Bug’s popularity spiked in the 1960s, this game made its way overseas to the United States. This is where the traditional game “Slug Bug” transitioned into “Punch Buggy”, but the rules mainly stayed the same as newer generations of the car kept coming out. By 1972, the Beetle surpassed the longstanding worldwide production record of 15 million vehicles, set by Ford Motor Company’s legendary Model T between 1908 and 1927. 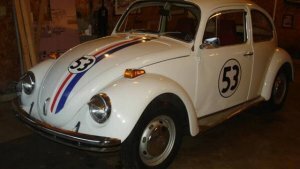 Probably One of the most recognizable instances of the VW Beetle being used in the media, Herbie was a sentient car that had a personality of its own. Multiple movies were issued for the car from 1968 all the way up to 2005. The premise centered around the same car being passed down from owner to owner and competing in races and falling in love with another sentient VW Bug. It also became a worldwide cultural icon, featuring prominently in the hit 1969 movie “The Love Bug” (which starred a Beetle named Herbie. Easily the popular second choice when distinguishing famous VW Beetle being used in the media, Footloose’s iconic sports edition VW Bug. In which was driven by both main actors of the original and the reboot, was an iconic mainstay for the advertising of the movie. With the young newcomer receiving the car as a gift from its original owner and using it throughout most of the movie. The third media instance would be the cover of the Beatles album “Abbey Road.” By the 1970’s, the “Punch Buggy” tradition had fully taken America by storm. This campaign launched in 2009 as a Superbowl advertisement, claims they started the game “over 50 years ago”, though this is a humorous historical fiction created by the ad agency Deutsch Inc.
Any Punch Buggy for for sale is playable. Any Volkswagen Beetle in a Car Show is playable. Any Volkswagen Beetle on the road is playable. Any Volkswagen Beetle that is parked is playable (unless in dealership or junkyard). Any Volkswagen Beetles in a Volkswagen dealer is not playable. 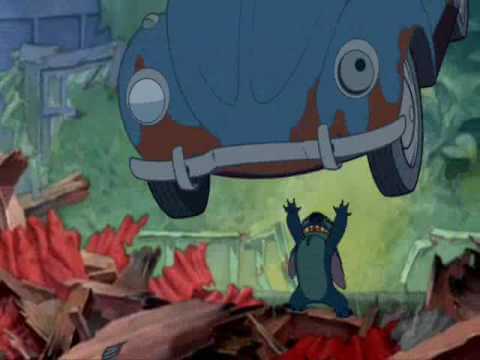 Any Volkswagen Beetles at a junkyard is not playable. Any VW Beetle that is sighted and first correctly announced by a player gives them immunity for that vehicle punch allotment. If a player sees a black Volkswagen Beetle, and says “(Type) Black Punch Buggy No Punch Backs!” they are only immune for that specific vehicle. If another black Punch Buggy appears, he is not immune unless he calls out that one as well! If the phrase “No punch backs” isn’t announced, that player is vulnerable to being punched! However, if the player remembers to say “No punch backs” before they are punched, it must be honored! Any Volkswagen Beetle that is playable, remains in play until there is one player left who hasn’t announced the Beetle, and all punches have been allotted. For future proofing purposes all variations of the Volkswagen’s Beetle will be regarded as playable. 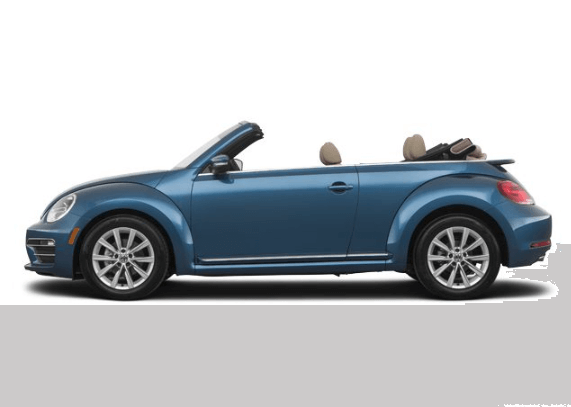 As older models inevitably become less common on the road, there is a need to include the newer Beetles. A bonus for calling out a sighting of an Older Beetle, seeing as how they are a rare sighting. Therefore, classic and antique bugs will count for multiple punches. All punches must be on the arm, all other places are prohibited. How to Play Punch Buggy! 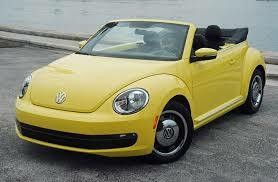 Since this is a “New” Yellow Convertible Punch Buggy/Slug Bug. 1 Punch for the New Beetle. 1 Additional Punch for it being a Convertible. How to Play Slug Bug Game! Since this is a “Old“ Blue Slug Bug/Punch Buggy. 2 Punches because this is considered an Old Bug. Old: A Volkswagen Beetle that appears to be over 35 years old. 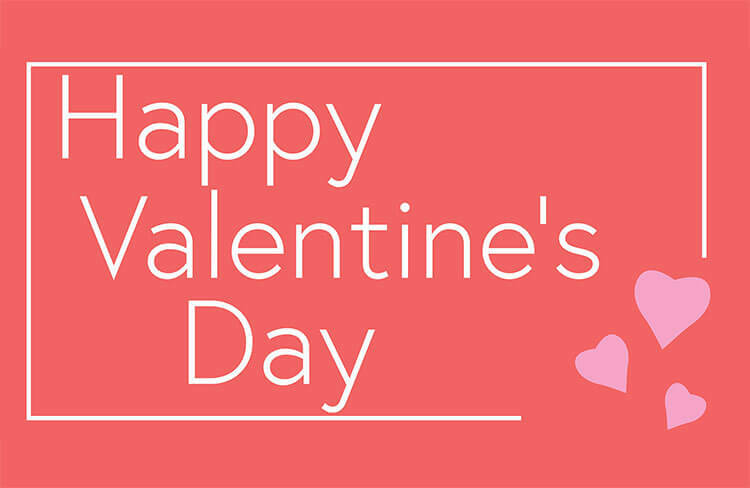 This tradition will eventually phase out, so enjoy it while it lasts; Unfortunately, Volkswagen is phasing out the 2019 Punch Buggy, so finding newer versions of the vehicle will become impossible unless Volkswagen decides otherwise. Any vehicle is covered by our Saver’s Club.